This book consists of six chapters arranged according to the different stages of research projects. Topics discussed include the different roles of business, engineering, and user-experience stakeholders; identification of research opportunities by developing empathy with stakeholders; and planning UX research with stakeholders. The book also offers ways of teaming up with stakeholders; strategies to improve the communication of research results to stakeholders; and the nine signs that indicate that research is making an impact on stakeholders, teams, and organizations. This book is meant for UX people engaged in usability and UX research. Written from the perspective of an in-house UX researcher, it is also relevant for self-employed practitioners and consultants who work in agencies. It is especially directed at UX teams that face no-time-no-money-for-research situations. "I find the book compelling because it’s international, based on experience, business oriented, and practical, and it has videos....The book is definitely international, with mini-essays by usability practitioners from all over the world (the videos are international as well). This produces a wide variety of contexts and highlights some interesting parallels." --Computing Reviews.com, December 5, 2012 "In this book, Tomer Sharon does a great and ground-breaking job of presenting useful wisdom on how to make usability research useful and usable, and how to sell it. The contents of this book can be summarized in seven words: Do as you preach and be humble. If that’s not sufficiently usable for you, read this book! "―Rolf Molich, DialogDesign "Tomer Sharon’s book is the cure for usability professionals whose work isn’t having the impact it deserves. Here you’ll find ways to work different, to make your research connect with stakeholders instead of trash cans. File under: work smarter, not harder." -Gerard Torenvliet, Senior Human Factors Scientist, Medtronic "A thoroughly readable look at how to make sure our user research actually makes it into the products we create. It explains how to get everyone engaged, how to plan research that asks the right questions, and how to help people use research findings. It's full of practical tips, great advice and real-life stories from practitioners. "―Donna Spencer, Maadmob "It’s Our Research" should be required reading for anyone involved in a UX research study. Sharon will not only help you avoid the many pitfalls that most UX research projects come across, but more importantly give you all the tips and tricks for getting the most out your UX research. "–William Albert, Bentley University; Author, Measuring the User Experience and Beyond the Usability Lab "There is probably no question that I am asked more often than "How can I have more influence?" User research that isn’t able to bring insight and drive improvement might as well not have happened. This book is the most complete guide to getting stakeholder buy-in that I have seen. It is a "must read" for researchers and their managers. "―Arnie Lund, Microsoft; Author, User Experience Management "As an experienced Human Factors Engineer, I thought I knew how to do user research and engage stakeholders. But in these pages I discovered new ways to ensure my user research will be useful to my clients. The book is well organized and includes rich interviews and case study content. I especially appreciated the takeaways at the end of each chapter." -- Stan Caplan, President, Usability Associates, LLC "The best researchers know how to inspire their stakeholders to act on their findings. At Google, Tomer brings a unique combination of depth and inventiveness in the way he communicates and works with the designers and managers who need to act on his findings. This learned, direct and humorous book explains how he achieves that." --Giles Colborne, cxpartners, Author, Simple and usable web, mobile and interaction design "If no one reads your report or implements your recommendations does it really matter how statistically valid your findings were? Do your yourself and your users a favor ...read Tomer’s Book." --Jeff Sauro, Principal Measuring Usability LLC; Author, Quantifying the User Experience "This guide explains how to increase the chances that stakeholders (such as product managers, engineers, and management) will actually act on the user experience (UX) research they have commissioned. The guide is written from the perspective of in-house UX researchers (especially 'teams of one'), but it is also relevant for self-employed practitioners and consultants. It will also be useful for design researchers, product designers, user interface designers, information architects, and human factors specialists. The book primarily discusses UX research on digital services, but also covers digital products and systems of products and services in industrial and medical settings. Advice is given on dealing with difficult people, combining quantitative and qualitative data, and communicating research results. The book's appealing layout includes color photos, illustrations, diagrams, screenshots, and charts. Web sites and video interviews can be accessed using quick response (QR) codes supplied in the book." 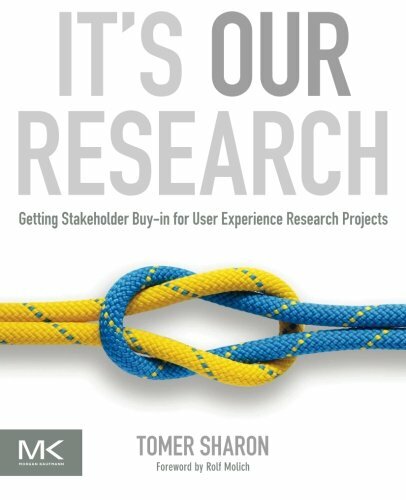 --Reference and Research Book News, Inc.
Tomer Sharon is a User Experience researcher at Google Search. Previously, he led the user experience research effort for Google’s online advertising management platform - DFP (Doubleclick for Publishers). Prior to Google, he worked at Check Point Software Technologies in Israel as User Experience Researcher Lead. As founder and first president of UPA Israel, he led the chapter to many achievements such as raising awareness of the need for easy-to-use, efficient, and fun technology products, and growing and nurturing a professional community of 1,000 practitioners. Tomer is an experienced speaker at local and international conferences, a published author of articles and papers, and a past editorial board member for UPA’s UX Magazine. Tomer holds a BA in Social Sciences from The Open University and a master’s degree in Human Factors in Information Design from Bentley University in Waltham, MA.